4 foot by four foot by six foot deep tapered hopper with safety / pouring grid. Stainless steel dust hood with hinged access door. Two filter cartridge dust filtration system with 2HP vacuum and pneumatic continuous filter cleaning system. Six inch diameter by 14 foot long continuous spiral elevating feeder conveyor currently configured with an anti-static plastic rigid tube; could be easily converted to a flexible tube. 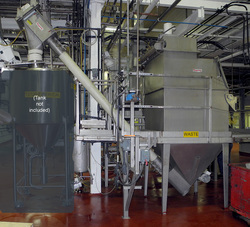 86 inch infeed height (catwalk shown in pictures not included), approximately 9' discharge height as configured. As of this writing, this elevating screw feeder conveyor with hopper is in stock at Alard, disassembled for transport, in very good condition, available for timely shipment. This page contains a single entry by Michael C. Shults, Alard Equipment Corp published on August 12, 2016 12:22 PM. Two stage trough belt FEED CONVEYOR, Alard item Y2596 was the previous entry in this blog. Urschel OV cutter / pickle slicer, Alard item Y3053 is the next entry in this blog.